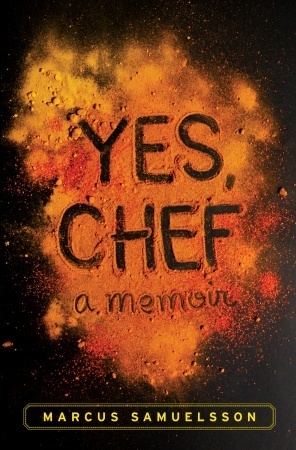 Yes, Chef is a book in several parts. The first part, where Samuelsson talks about being adopted from Ethiopia, along with his biological sister, and placed with the Samuelssons in Sweden was lovely and moving to read as an adoptive mother. It sounds like the Samuelssons, who didn't have message boards or books for adoptive parents to rely on, really got things right with their three kids. That doesn't mean that everything was always easy for Marcus, but that his parents were there for him and tried their best to honor his heritage and pave the way for him to thrive in Sweden. If I had to rate the book after that section, I would have given it a five. The next section talks about Samuelsson's training, which took place in kitchens all over Europe and America, as well as stints on cruise ships. It talks about his failure to become a father to the daughter who was born from a one-night-stand. It talks about losing friends and finding his identity, and eventually, coming to America. The third part of the book, the one where Samuelsson becomes a celebrity chef, was the one that was least engaging for me. It was still startlingly well-written, lyrical and metaphorical, for a book penned by a nonwriter, but the whole "rise to the top of the NY culinary scene" wasn't as interesting. Still, a good book, even for someone who doesn't have aspirations to open a restaurant. I've been interested in reading this, so thanks.